Using analytics tools to collect massive amounts of Big Data from your organization is one thing. Extracting meaning from that data and using it to drive real growth is another. Business analytics solutions implemented by Clariba can help you unleash the power of collective insight by delivering enterprise business intelligence, agile visualizations, and advanced predictive analytics to all users — on any device or platform. Team up with us and we will ensure we implement the right solution for your organization. SAP Analytics Cloud is a next-generation software-as-a-service (SaaS) solution that offers business intelligence, planning, predictive functionalities all in one place. Built natively on SAP Cloud Platform, it helps companies overcome the challenge of point solutions and data silos spread throughout the organization with enterprise-wide access to analytics and a consumer-grade user interface. Easily discover and share insights – and make better decisions— by relying on the SAP BusinessObjects Business Intelligence (BI) platform. With flexible architecture, our analytics platform can support your growth from a few users to tens of thousands of users, and from a single tool to multiple tools and interfaces. Harness data company-wide so you can gain and share unprecedented insight to compete boldy in today’s digital economy. 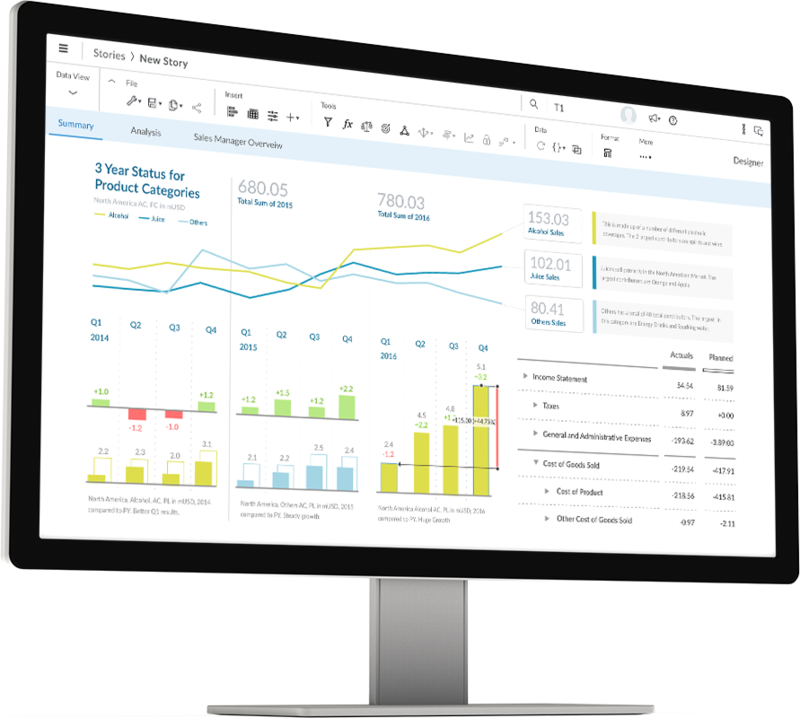 SAP Lumira combines self-service BI discovery and visualization with interactive dashboards and analytic applications – all in one solution that rapidly promotes insight across the organization. so you can quickly answer complex business questions. Deliver the right insights to the right employees at the right time. Provide your team with secure access to critical business intelligence on any device, no matter where they are. The mobile BI app, SAP BusinessObjects Mobile, is designed to help you stay competitive in today's global, "always on" business environment.